Yesterday (Wednesday) bhaktas commemorate Meerabai Jayanthi. Meerabai was a great saint of the Vaishnava bhakti movement, who lived in the 15-16th century. 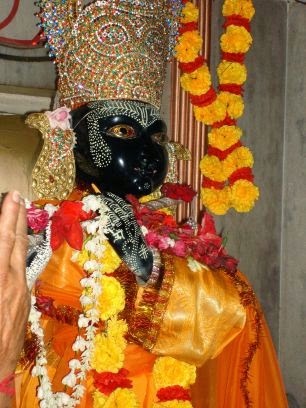 Murti of Krishna into which Meerabai merged with her physical body. “She was a princess who loved Krishna with all her heart. There was not even a single cell in her that was not in Love with Krishna. "One day she was sitting in the temple and was singing for Krishna; whenever she would sing for Krishna, people would see Krishna, standing next to her. The King disguised himself. He was a Muslim king, Akbar, so he disguised himself and he was so touched by the devotion of Meerabai, that he gave his pearl necklace to the temple. Of course, Meerabai didn’t take anything. "For that they said, ‘We command you to drink poison.’ She said, ‘Okay, if you have condemned me for that, I accept it.’ So they brought the cup with the poison for her. 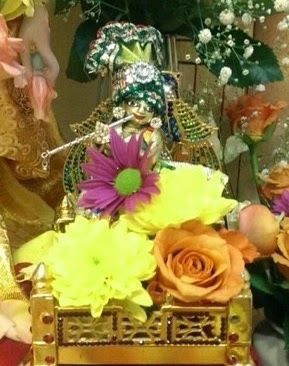 As she was drinking it, she thought of Krishna, she thought that Krishna was giving her Divine nectar – amrit – to drink. She drank this poison, and she walked to the nearby temple of Krishna. Everybody followed her. She entered the temple and as she had the effect of the amrit, she became one with her Lord. She disappeared physically into the deity in the temple. This year, in May, during the 9 Goddesses ' Pilgrimage (North India), Sri Swami Vishwananda visited a Krishna temple, where unexpectedly he found the Krishna murti into which Meerabai herself merged with her physical body. 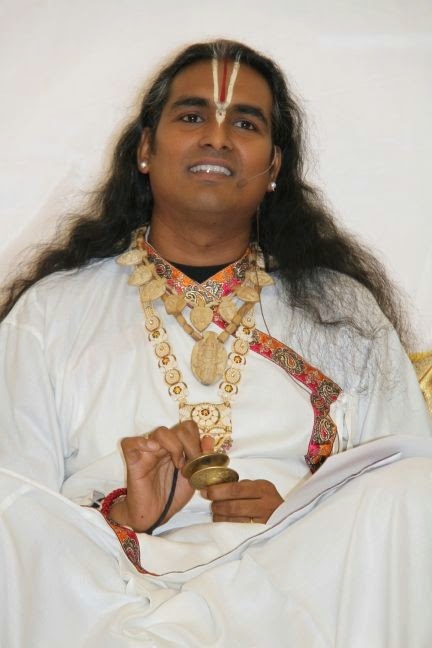 The whole story can be found in this blog ( http://swamivishwananda-info.blogspot.de/2014/05/9-goddesses-tour-day-3-4.html ). 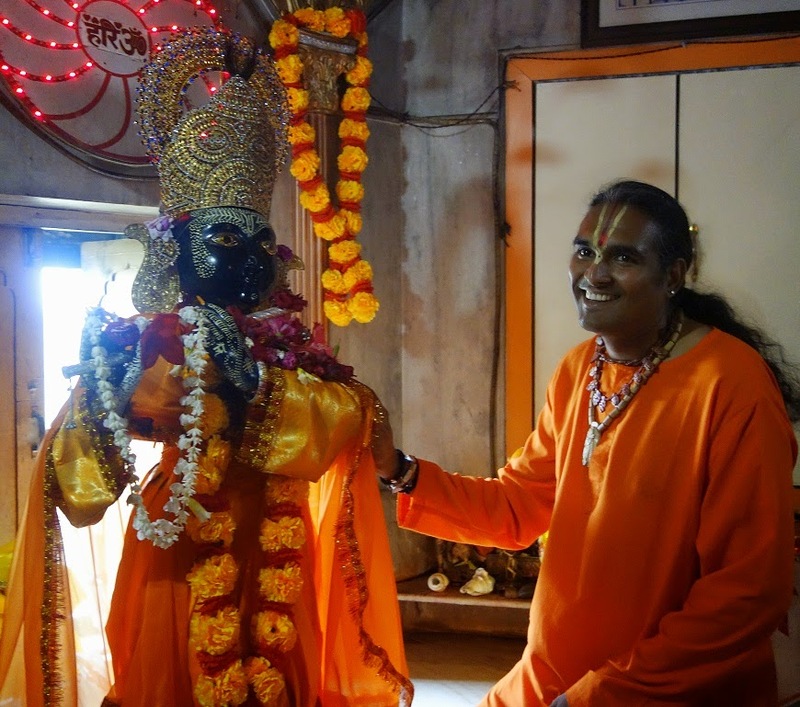 The priest responsible for that temple offered a smaller murti of Krishna, called Nurbur Krishna as a gift to Sri Swami Vishwananda, who afterwards named it as Giridhari Gopal. Since then this murti is worshipped daily and travels with Swamiji abroad, being present also during this week, at all events of the tour in Portugal.